Fabulous luggage find! Grads? Touring choir? Summer vacation? 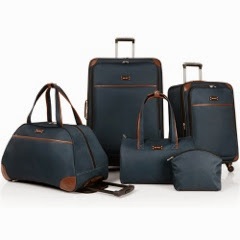 Nine West Round Trip 5 Piece Spinner Luggage Set has everything you need for a successful trip. The suitcases expand for added packing capacity and the spinner wheel system makes for easy maneuvering down the narrowest aisles. Even the Wheeled Bowler features a handle that tucks away when not in use.